Joseph Slaughter's Human Rights, Inc.: The World Novel, Narrative Form, and International Law is truly interdisciplinary, reading literature through law in a way that demonstrates a deep familiarity with both. At a time when Human Rights has become an important focus of interest in literary and cultural studies, Joseph Slaughter's magisterial book explores what he argues is the crucial role of the novel, and particularly the European Bildungsroman, in creating the subject of human rights, the subject on whom rights can be predicated. 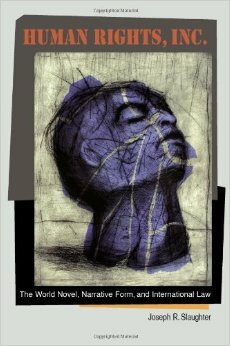 Reading European novels and their post-colonial successors, Slaughter shows how they have done crucial socio-cultural work in the absence of alternative international structures that might articulate and enforce human rights by naturalizing the subject of rights and rendering intelligible a conception of the individual to whom human rights law can then apply. Slaughter argues, and demonstrates, that the Bildungsroman can be read as the cultural correlative of Human rights, that both the Bildungsroman and human rights are globalized in our time by the widespread translation of the humanism they share as well as by a consumer-driven commodity economy. Human Rights, Inc. is theoretically sophisticated and historically informed, drawing on Jürgen Habermas's analysis of the rise and fall of the liberal public sphere in the eighteenth century and on accounts of the contemporaneous formation of the modern, rights-based national state. But he also examines the complicity of human rights law and the novel with globalization and multinational capitalism. Human Rights, Inc. is enormously erudite and ambitious. Against the backdrop of the older European Bildungsroman, Slaughter treats a global range of contemporary postcolonial Bildungsromane by writers such as Calixthe Beyala (Cameroon), Marjorie Oludhe Macgoye (Kenya), Tunana Mercado (Argentina), Michael Ondaatje (Canada via Sri Lanka [at that time Ceylon]), Epeli Hau'ofa (Tonga), Tsitsi Dangarembga (Zimbabwe [at that time Rhodesia]), and Christopher Hope (South Africa). Wide ranging in its literary reference and in its exploration of historical movements and theoretical discourses relevant to human rights, this is an original account of the role of the novel in our time that raises important ethical questions while keeping comparative literary study clearly in view. Illuminating the postcolonial transformation of the humanistic values at the foundation of the classical Bildungsroman, the book has much to say about the globalized world we live in today. In other words, the study represents comparative literary theory and practice at their best.